Nintendo is keen on dipping its oversized toe into the free-to-play gaming market, and it's pinned its hopes on a nearly-forgotten 3DS launch title. When Steel Diver debuted alongside the Nintendo 3DS, it was hailed as a good game. Not great, not amazing, and certainly not game of the year material, but in those days when there was so little software available for the handheld, it was one of the best options players had. Most thought that would be last we ever heard of the submarine action title, but then recently, out of nowhere, the gaming giant announced that it would be reviving Steel Diver as its first attempt to break into the increasingly lucrative, increasingly popular free-to-play games market. 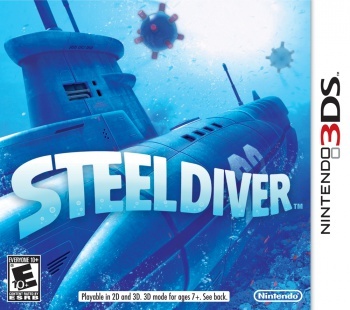 However, it doesn't look like this new iteration of Steel Diver will be the exact same title that accompanied the 3DS to its retail debut. For that matter, we don't even know that this new Steel Diver will be a 3DS game. It could be a Wii U game, or even a browser title, for all we know. Despite this uncertainty, legendary game designer Shigeru Miyamoto has high hopes for the game. "There is something we're doing with the Steel Diver idea that I think is going to open things up with that game ... It's going to be very fun," Miyamoto stated during last Nintendo's latest investor conference call. "We're exploring from a perspective of where we can take that from a multiplayer standpoint - it's going to have this four-player battle mode that I think is going to be very interesting." According to Miyamoto, this game will be shown to the public "relatively soon," but at the moment it appears that Nintendo is still hashing out the details of the title's free-to-play business model. Now normally we'd take a developer's claims about an upcoming game being "very fun" with a two ton block of salt, but the truth is that we're inclined to believe Miyamoto on anything having to do with game design. I can't think of another developer in the history of the gaming business with as many amazing titles to his name, and so few missteps, so when Miyamoto publicly states that a game is going to be fun, we have no reason to doubt the man. That free-to-play bit does worry us somewhat, as we'd hate to see Nintendo titles gravitate toward the all-too-common pay-to-win iteration of that business model, but at the same time Nintendo, for all of its failings, has always been a big proponent of offering gamers a complete gaming experience in each of its titles, despite how many other developers have taken the relatively recent downloadable content trend as a cue that they can strip concepts out of their titles and make more money by releasing them later as DLC. We have no idea where Nintendo is going with Steel Diver, but we're very intrigued. We'll bring you more on this game just as soon as the company has something concrete to share.